We’ve got a lot of cosmetic content coming up on July 20th. Here’s the lowdown! To start, we’ll be sprinkling the campaign with some well-earned rewards. Now, you can earn new player portraits as well as exclusive Elite skins upon completing certain campaign missions. The campaign menu screen has gotten a bit of a revamp, too, so you can see which rewards you’ll receive before you embark on a mission. Don’t worry - if you’ve already completed the campaign, you’ll receive all rewards upon your first login after the patch goes live! On top of the campaign reward skins, we’ve got plenty more coming your way! 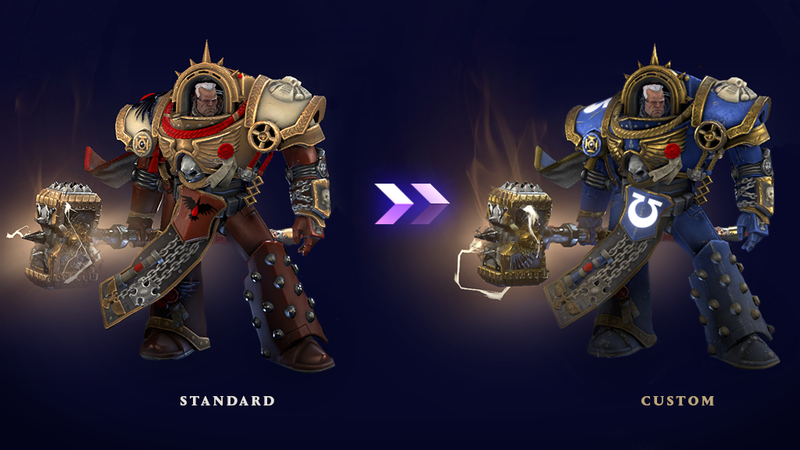 This patch will introduce four new skins, a revamp of the Imperial Knight Paladin’s mastery skin, and eight skins that will allow you to customize the colours of select Elites. These “Customization” skins - as we’ve been calling them - will let your Elites sport your chosen Army Painter colours so they can lead the troops in style. Each of the new skins will also be affected by your chosen paint scheme. Having Elites better blend into your ranks is something you’ve been asking for, and we loved the spirit of making your armies feel more cohesive. We read a lot of feedback on how you wouldn’t want Gabriel Angelos, Chapter Master of the Blood Ravens, leading your Ultramarines into battle - and hey, that makes a lot of sense! Now, campaign-based Elites can look more universal, letting you bring any Farseer into battle, instead of Macha specifically. For the new skins, you’ll need to complete certain campaign missions in order to unlock them. If you already have the Imperial Knight Paladin’s mastery skin, the new look will be applied automatically. For all the Customization skins, you’ll get these just by logging in! 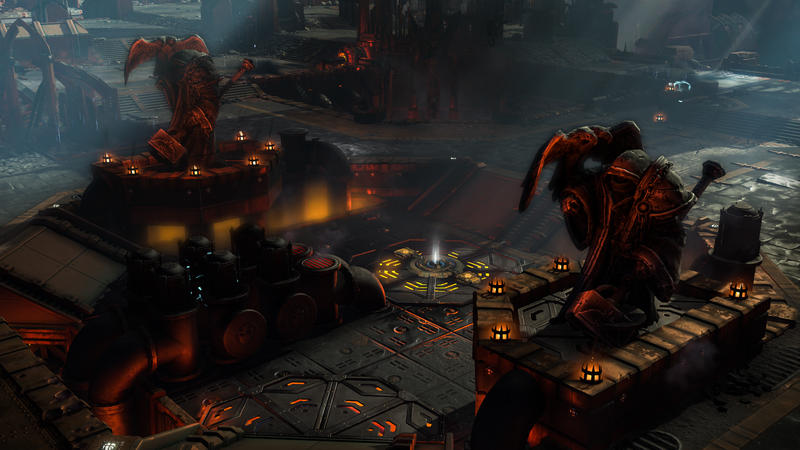 This patch will also bring a new map, Manufactorum, into the fold! Manufactorum can be played in 2v2 or 3v3 scenarios and across all game modes. Here’s a sneak peek of what to expect! We’ve introduced some changes to Elite and doctrine selection, as well as improvements to how Elite information is displayed when you hover over their portraits. You’ll also be able to see what effects doctrines will have on your units just by mousing over them. This will help to make it easier to determine your loadout in the pre-game lobby by highlighting the differences between Elites and doctrines at-a-glance! I like the skins, but no balance? Thanks for the update. Any chance for any ETA on the next balance patch? 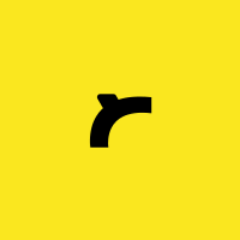 Or any comment on where you guys are in terms of future plans and letting us know? OMG these look amazing! Beaky helmet for Jonah? Yes please! Good update, the content is growing and I like what I see. Though balance update would be a welcome sight too. Edit: Tartaros Gabe is 100% Dakka. Hopefully those helmets quiet the gatekeepers that left bad reivews. Nice job art team. I wish we got another 1v1 map as well though. Are you serious? Skins and one map, that what we wait for a month? At least too hard add annihilation in automatch to bring up online? It has only been two weeks since the last balance patch. Likely more time is needed to collect data and identify trends, especially considering the low population. Good to see more content being added. That's nice, but............skins are last thing that's interest me. New map is cool, but I would like to see new elites and especially new races, even though I doubt that of the latter happening for real. Still I apprecciate that you still support this game, even if it is dead game now. But I would gladly play once I will get it. I'm also interested in Campaign Rewards, does that mean that some of the new and custom skins are reward for campaign too? the balance isnt that terrible. i feel the gamemode its sat in exaggerates any problems. Not every patch has to be balance patch. Some people want more content too. 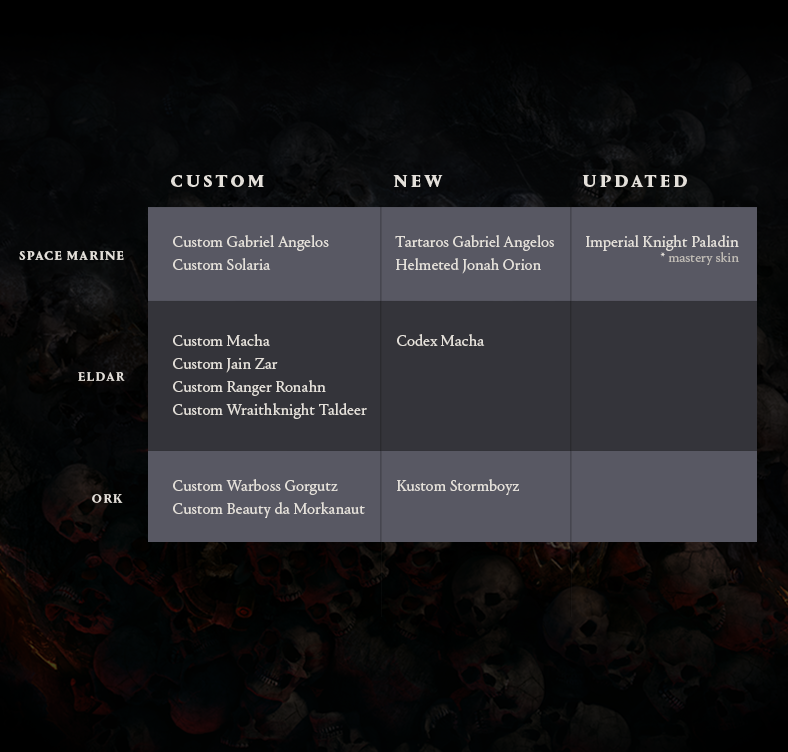 I really like the option for more cohesive armies now, regarding units like Angelos and Gorgutz that were stuck as Blood Ravens and Bad Moons respectively. Can we get a clear yes/no on whether there will be a balance patch before the Bellum July 21st tournament? 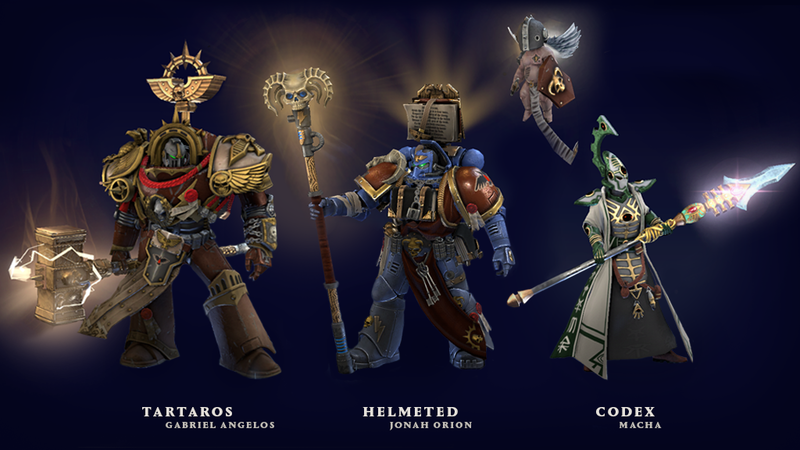 Interesting to note, those new skins for Gabriel, Jonah and Macha are actually mostly helmeted versions. I wonder if we can customize their colors as well. Disappointing! New cosmetics... I'm no marketing analyst/expert, but I'm pretty sure no one cares about skins. We want balance and content that doesn't add just visuals. Don't get me wrong, people appreciate the effort but it seems like you've taken 90% of your work force off of DoW III and just left 3 man troop to gather together the scraps of this game. About the community update, cool! But and 1vs1 maps? There is just 4 with 2 being uterly ++heresy redacted++ and 2 being very meh... But the skins are very cool. Paladin mastery update is weird since IMO paladin is kind of the only mastery noticiable skin already. Very sorry if I annoys you. Still I'll give you to know when I'll already bought this game. Also don't forget about Campaign Rewards and UI Improvements. I still wish to see even single new race, but oh well. Still good to see Relic still working on this game, even if most players had left. Need more 1v1 maps please! Team maps are cool but we don't have any tournaments centered around them. The four new skins - Tartaros Gabriel Angelos, Helmeted Jonah Orion, Codex Macha, and Kustom Stormboyz - are all campaign rewards, along with some additional player portraits. All of the Custom skins, you'll get those just by logging in (though there may be a delay when the patch first comes out, as there are a lot of accounts that we need to award the skins to). Greatly thanks. I appreciate that. The skins look great! Plenty of people asked for the ability to paint elites and Relic delivered. Good job. Having said that I really hope the Custom Macha skin has a helmet. I don't think so. But as Kat_RE answered me, you can paint Macha's helmeted version as well. @Draconix is correct! Essentially, you can choose to have a standard Macha that you've coloured to match your army, or the Codex Macha - which has the helmet.